Also serving communities of Duncannon, Millersburg. There are 21 Assisted Living Facilities in the Harrisburg area, with 9 in Harrisburg and 12 nearby. The average cost of assisted living in Harrisburg is $2,397 per month. This is lower than the national median of $3,346. To help you with your search, browse the 105 reviews below for assisted living facilities in Harrisburg. On average, consumers rate assisted living in Harrisburg 4.3 out of 5 stars. Better rated regions include Middletown with an average rating of 4.5 out of 5 stars. Caring.com has helped 13 families in Harrisburg find high-quality senior care. 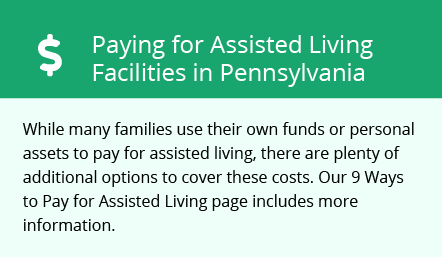 To speak with one of our Family Advisors about assisted living options and costs in Harrisburg, call (855) 863-8283. Harrisburg is the state capital of Pennsylvania and is located on the picturesque banks of the Susquehanna River. Filled with senior-friendly amenities, the city is home to a senior demographic that makes up 14 percent of its population. To service this population, there are currently nine assisted living facilities, also known as personal care homes, in Harrisburg with a further 48 located nearby. These facilities are licensed by the Pennsylvania Department of Human Services and provide assistance with activities of daily living. Some offer specialized care for residents with conditions such as dementia or disabilities. Seniors who live on a fixed income may be pleased to learn that Harrisburg’s cost of living index of 88 is well below the national average cost of living index, which is 100. Harrisburg is home to multiple senior centers like the Friendship Center Senior Center, which features services and activities like senior fitness classes, yoga, line dancing and special events. The city of Harrisburg is home to world-class medical facilities, including Hamilton Health Center, in the event of medical emergencies or illness. Pennsylvania does not tax social security checks. This leaves more money in seniors’ budgets. Additionally, Pennsylvania does not typically tax withdrawals taken from work retirement and 401k accounts. The state’s sales tax is 6 percent. Seniors who plan to take public transportation will have convenient access to the Capital Area Transit bus service, which features fixed routes throughout the city. Seniors who have a Medicare card ride can take part in the half-rate program. Weather in Harrisburg may prove difficult for some seniors. The July average high is 86 degrees Fahrenheit, which can be challenging for seniors with breathing difficulties. Additionally, the January average low is 21 degrees Fahrenheit. Harrisburg winters feature icy and snowy weather conditions that make it hard for seniors to traverse the city. Assisted Living costs in Harrisburg start around $2,622 per month on average, while the nationwide average cost of assisted living is $4,000 per month, according to the latest figures from Genworth’s Cost of Care Survey. It’s important to note that assisted living rates in Harrisburg and the surrounding suburbs can vary widely based on factors such as location, the level of care needed, apartment size and the types of amenities offered at each community. Seniors who receive SSI and need to live in an assisted living facility may qualify for the state to pay a supplement to the facility. To see a list of free assisted living resources in Harrisburg, please visit our Assisted Living in Pennsylvania page. Harrisburg-area assisted living communities must adhere to the comprehensive set of state laws and regulations that all assisted living communities in Pennsylvania are required to follow. Visit our Assisted Living in Pennsylvania page for more information about these laws.